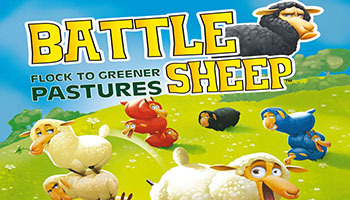 In Battle Sheep (first released as Splits), players start the game by constructing the board from identical four-hex tiles, then each player places his/her tall stack of discs on one of the border hexes. Players take turns removing some number of discs from the top of one of their stacks, moving that new stack of discs as far away as it can go in a straight line. Players must leave at least one disc behind when moving, so the board gradually fills up and movement opportunities become more and more scarce. The player occupying the most spaces at the end of the game wins! Rivaling sheep herds are battling it out to control the most space of Farmer Pat's pastures. 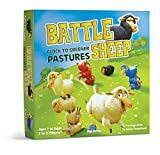 Watch out for sneaky sheep and plan your moves carefully to advance your herd and fence out the foe. 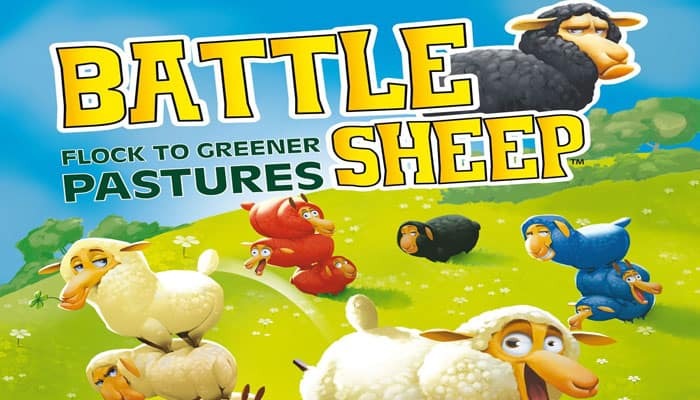 Conquer the most pastures to win this fast-moving strategy game. Remember, the grass is always greener for strategic sheep!